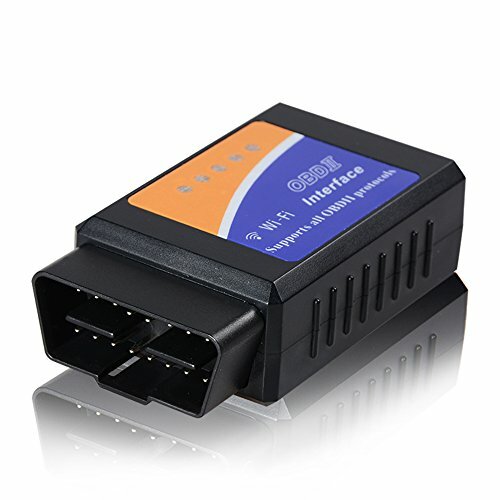 Remark:For your vehicle to be OBD II compliant it must have a 16-pin DLC (Data Link Connector) under the dash and the Vehicle Emission Control Information Label must state that the vehicle is OBD II compliant. 2.Support iOS & Android & Window Via WiFi. Support (free "OBD Car Doctor "APP) for iOS.Support "Torque Pro "APP for Android device.Easy to use,You just need a Wi-Fi connection and you can diagnose any car problem and unlock massive amounts of data on your car's performance in real time! 4.Display current sensor data.Including Engine RPM, Calculated Load Value, Coolant Temperature, Fuel System Status, Vehicle Speed, Short Term Fuel Trim, Long Term Fuel Trim, Intake Manifold Pressure, Timing advance, Intake Air Temperature, Air Flow Rate, Absolute Throttle Position, Oxygen sensor voltages/associated short term fuel trims, Fuel Pressure. 5.12 Months Warranty from AOKEN.Pls feel free to contact us if you have any issue(Emai:sunyilinteam4@foxmail.com).Your satisfaction is our total goal! If you have any questions about this product by AOKEN, contact us by completing and submitting the form below. If you are looking for a specif part number, please include it with your message.